A shared calendar for public shows and events allows event organizers to update information in real-time, and keeps the public updated on area events. 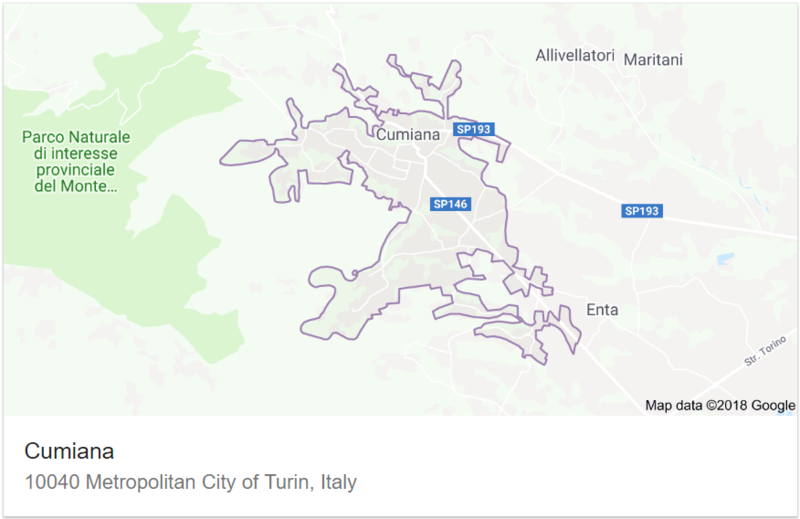 Cumiana is a small village at the foot of the alps, a municipality in the Metropolitan City of Turin, in the Italian region Piedmont. It is located about 30 kilometers (19 mi) southwest of Turin. The main purpose of an online calendar for public shows and events in Cumiana is to ensure that event information is always updated and accessible to everyone. Calendar users include event organizers and collaborators, as well as people who live in Cumiana and surrounding areas. A shared municipal event calendar makes the most of new technologies that are now widely available, helping people who are interested in public shows and events stay informed and updated. There are also some secondary purposes for the calendar, such as better management of event planning and verification of event information from associations and organizations. In the verification process, event organizers and planners can share, in real time, all the dates and activities already planned or in the planning stage. Even if events and shows are in a pre-scheduling phase, everyone accessing the calendar can get a better idea of all the events, shows, and opportunities in the municipality for any given time. This helps create a better distribution of public shows and events, limits overlapping or conflicting event schedules, and can lead to better participation and attendance for events. 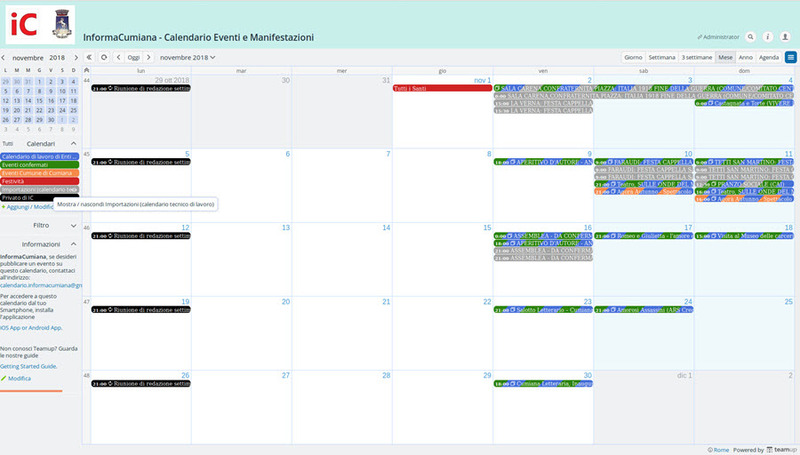 The online calendar of public shows and events in the Municipality of Cumiana, in this experimental version, uses Teamup for managing “shared calendars.” These shared calendars are organized and managed centrally and are accessible to various levels of users, without the need for registration on any site. Any association or organization that needs to publish public shows and events can request a unique “personalized code.” This unique code allows the event organizers, without any other formalities needed, to access and input event details into a “work calendar” which is shared with other associations and organizations. This sub-calendar called “work calendar” is not accessible or visible to the public at large. It is only useful for organizations and associations for the management and planning of dates in a collaborative way. All this planning is done prior to publishing event details to the public. The online method–using a digital, shared calendar accessible to everyone–eliminates the typical delays and latencies of manual paper management. The organization or association that has obtained their unique “personalized code“ can enter events independently, with an easy-to-operate system, directly in the work calendar. They can add useful and essential text or images: descriptive details that, as soon as they are posted, become visible to other associations and organizations, as well as to the editors of InformaCumiana. In this phase the events will not be visible to the public just yet. 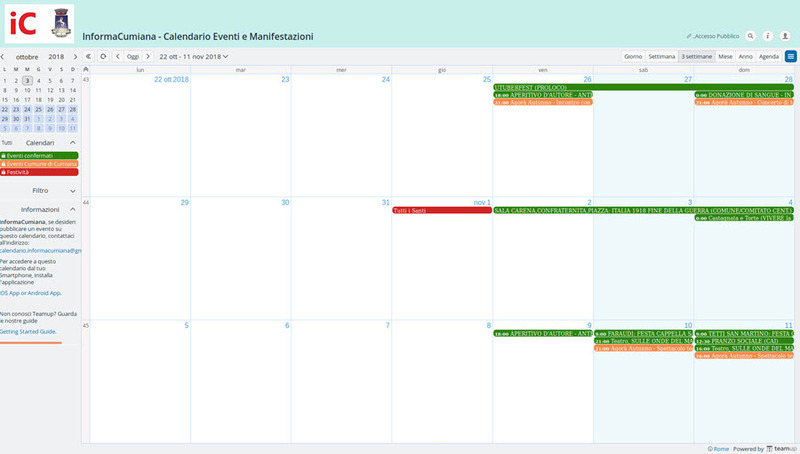 Shows & Events Calendar of Municipality of Cumiana, Italy, with work-in-progress sub-calendars for editors. If there are associations or organizations which do not have computer capability, they can request their events to be posted by the editorial office. They can provide the event details in traditional paper format. This mode, however, does not allow real-time event updating and management; it inevitably introduces delays and potential errors, typical of a manual, paper-based management. In addition to the main public calendar, there are also supplementary sub-calendars. One such sub-calendar is dedicated to national holidays; one is for the proper activities and events of the Municipal Administration itself, in addition to some other functional calendars. The events on the work calendar, once confirmed by the editors, are added to the public calendar. Once an event is included in the public calendar, everyone can see the events and have a “real time” view of details for all scheduled public shows and events. The public calendar is therefore available to the public at large, any time, and can be accessed by anyone who wants to view it. Since this is an evolving, active service, each element and procedure could undergo variations and functional changes, even without warning, according to the needs that arise to make the service more useful to the community. The online, shared nature of this calendar system makes such changes easier to implement, while maintaining public usefulness. Thanks to Giorgio Chiaretta for sharing this inspiring story!